Our elites tell us over and over that there is no connection between illegal immigration and crime, yet here is another example of the very thing they tell us doesn’t exist, or that is a figment of our racist imaginations. Once again, our leaders have made the U.S. a haven for criminal aliens via their open borders policies. In this case, a gang member participated in the assassination of and El Salvadoran prosecutor and he illegally entered the country in March. Do you really think he lived the life of a cloistered monk during this time? LOS ANGELES – A Mara Salvatrucha (MS-13) gang member captured recently in the Los Angeles area who is wanted in his native El Salvador for his role in the assassination of a government prosecutor, was removed to his home country Friday by U.S. Immigration and Customs Enforcement’s (ICE) Enforcement and Removal Operations (ERO). Javier Arnoldo Ceron Gomez, 21, was repatriated on board a charter flight coordinated by ERO’s Air Operations Unit. Upon arrival at the airport in San Salvador, El Salvador, ERO officers turned the suspect over to top-level Salvadoran judicial and immigration officials. 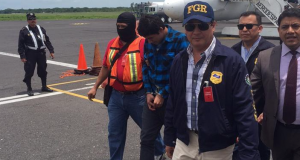 According to Salvadoran authorities, Ceron was one of several MS-13 gang members involved in the March slaying of Andres Ernesto Oliva Tejada, a prosecuting attorney in the homicide unit of the Salvadoran Attorney General’s Office. Oliva was shot multiple times by assailants on motorcycles while he parked his car. On June 4, ERO officers received information from Interpol that Ceron was wanted in El Salvador for aggravated homicide and might be living with relatives in the Los Angeles area. Armed with that intelligence, ERO officers, working closely with the U.S. Marshals Pacific South West Regional Fugitive Task Force, immediately began surveillance of possible suspect locations. A week later, on June 11, the officers tracked the accused assassin to a Santa Ana car dealership where he worked washing cars and took him into custody without incident.